During the wee hours this morning while the moon — one day short of officially full — silvered the landscape, our first killing freeze finally arrived. This morning’s low was 23 degrees Fahrenheit — low enough to dissuade even heartier perennials from further blooms. This is as it should be, of course. In fact, I’m grateful that we can all now turn to winter meditation tasks, while bees and butterflies, mosquitoes and gnats take a well-deserved break from their appointed tasks. As the sun reluctantly rose this morning, evidence of last night’s moonlit chill was abundant. Sparkling white diamond frost coated every leaf, stem, flower, and garden bench. Where the sun’s rays touched the frost, it melted into submission. But the moon had already done her work, ending another growing season. 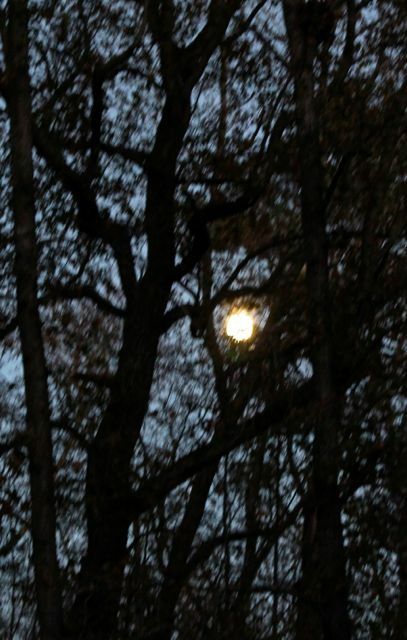 Last night’s moon kisses the treetops as it climbs higher. I sleep poorly when the moon is near or at its fullness. I especially love to wander through my dark house in the wee hours of a winter full moon. I can walk without tripping, because moonlight streaming through windows allows me to see everything in its silvery glow. All is quiet, except perhaps for occasional howls from hungry coyotes, or in late winter, the pipe-organ calls of owls claiming territory and hooting about love. This year more than most, I need this quiet, moonlit time to re-gather myself, to find my way forward. Always for me, of course, that will mean immersing myself in the green world — growing food, for humans and wildlife — and sharing my love of this world with others, in the hope that we will all enjoy centuries more of silver-touched, fertile landscapes. I took the first two photos above with my little camera, sans tripod, standard lens. 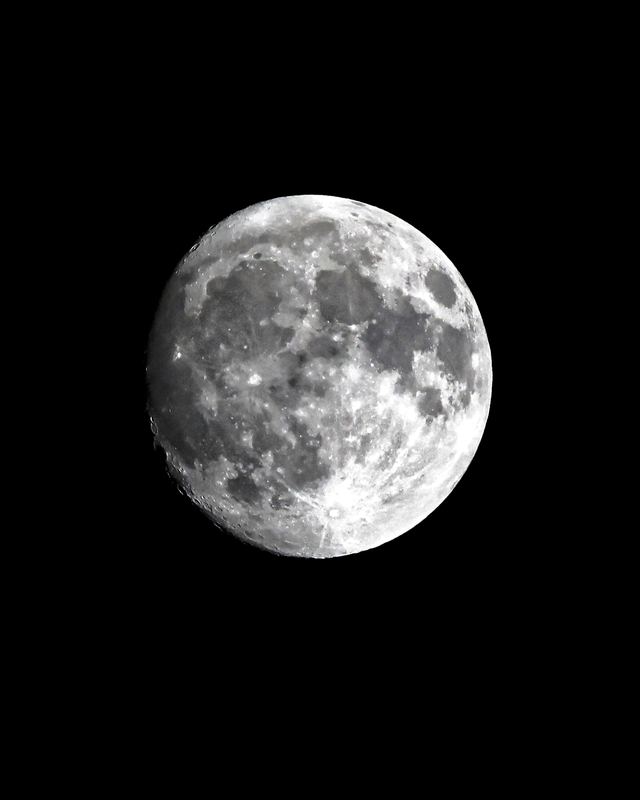 But I leave you with this moon portrait shot by the ever-amazing Wonder Spouse. He used my camera, but attached his fancy, longer lens, and attached it all to his tripod. After a little post-processing, the result is this shot here. 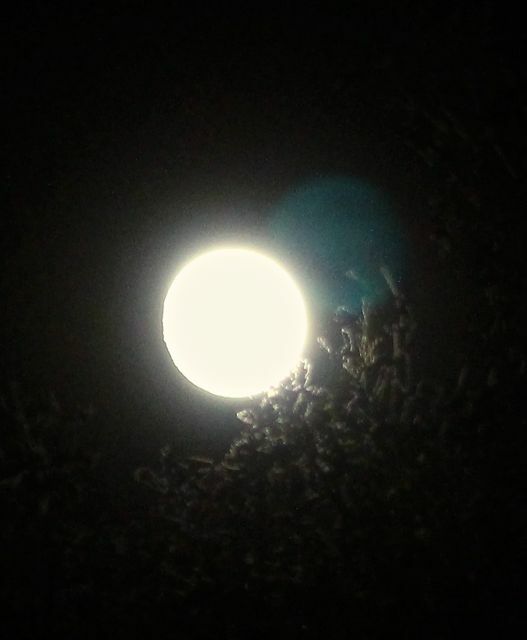 May we all find solace, and the strength to continue, beneath the silvery light of tonight’s supermoon. This entry was posted on November 13, 2016, 9:44 am and is filed under piedmont gardening. You can follow any responses to this entry through RSS 2.0. You can skip to the end and leave a response. Pinging is currently not allowed. A truly lovely post. Thank you for sharing your photos and writing. They enrich the experience of living in this area. Thank you very much, Jacquie, for your kind words. They are much appreciated. And thanks for reading my posts. Happy gardening to you and yours.